It is the continuous reports of unethical behavior in the form of data manipulation, cheating, plagiarism, and other forms of unacceptable behavior that draw attention to the issues of misconduct. The causes of misconduct are manifold whether it is the need to advance in a chosen discipline or to compete successfully for and obtain research funding. Disappointingly, individuals who are oriented to any form of dishonesty are individuals who had previously displayed little or no consideration for the feelings of others and are therefore more interested in themselves, at the expense of the students, and others recognizing them by any means necessary. This ground-breaking and honest examination of ethics in the university setting is unabashed in its descriptions of misconduct in the academic world. The text is well furbished with numerous citations that point to academic misconduct and the final chapter deals with the means by which misconduct can be mitigated, a strong reminder to everyone in the academic community that above board conduct must be part of our overall message of learning and part of the whole point of education in the first place. 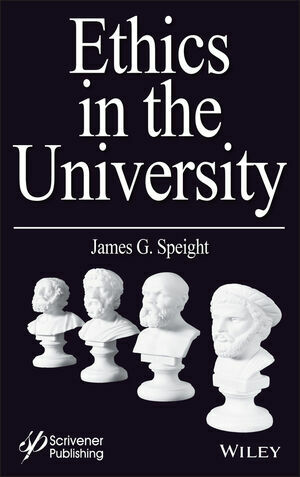 A must-have for academics and non-academics alike, this text is the second in a series of books on ethics by James G. Speight, and it is useful to anyone, in any industry, who is interested in ethical behavior and how to navigate the sometimes murky depths of our professional lives. James G. Speight, PhD, has more than forty-five years of experience in energy, environmental science, and ethics. He is the author of more than 65 books in petroleum science, petroleum engineering, biomass and biofuels, and environmental sciences. Although he has always worked in private industry which focused on contract-based work, Dr. Speight has served as Adjunct Professor in the Department of Chemical and Fuels Engineering at the University of Utah and in the Departments of Chemistry and Chemical and Petroleum Engineering at the University of Wyoming. In addition, he was a Visiting Professor in the College of Science, University of Mosul, Iraq and has also been a Visiting Professor in Chemical Engineering at the University of Missouri-Columbia, the Technical University of Denmark, and the University of Trinidad and Tobago.